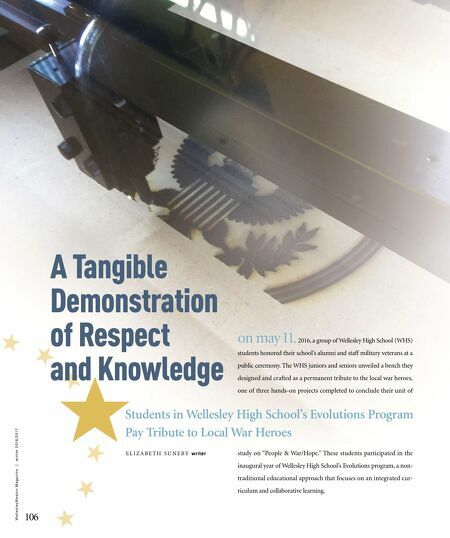 on may 11, 2016, a group of Wellesley High School (WHS) students honored their school's alumni and staff military veterans at a public ceremony. 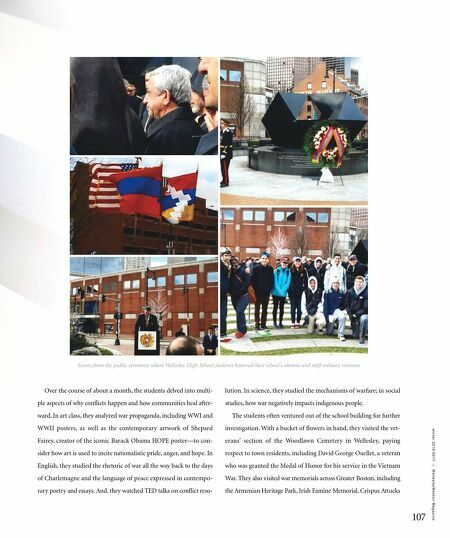 The WHS juniors and seniors unveiled a bench they designed and crafted as a permanent tribute to the local war heroes, one of three hands-on projects completed to conclude their unit of 106 W e l l e s l e y W e s t o n M a g a z i n e | w i n t e r 2 0 1 6 / 2 0 1 7 Students in Wellesley High School's Evolutions Program Pay Tribute to Local War Heroes E L I Z A B E T H S U N E B Y writer A Tangible Demonstration of Respect and Knowledge study on "People & War/Hope." These students participated in the inaugural year of Wellesley High School's Evolutions program, a non- traditional educational approach that focuses on an integrated cur- riculum and collaborative learning.